Anthony Masters, a British novelist and biographer, has produced the first full- length life of Bakunin in English since E. H. Carr’s Michael Bakunin (published in 1937). Carr’s work, though scholarly, readable, and indispensable to anyone inter¬ested in Bakunin, nevertheless placed undue emphasis on the more eccentric aspects of Bakunin’s personality and career, while paying insufficient attention to his major writings and their impact on the revolutionary and working-class movements of the nineteenth and twentieth centuries. There has long been a need for an up-to-date biography, correcting these deficiencies and incorporating the recent findings of other Bakunin specialists, such as Arthur Lehning and Michael Corifino. Unfortunately, Masters does not satisfy this need. His life of Bakunin, far from being an “exciting” biography—as described by Roderick Kedward in his brief but interesting foreword—is characterized by hasty writing, skimpy research, and inadequate documentation. 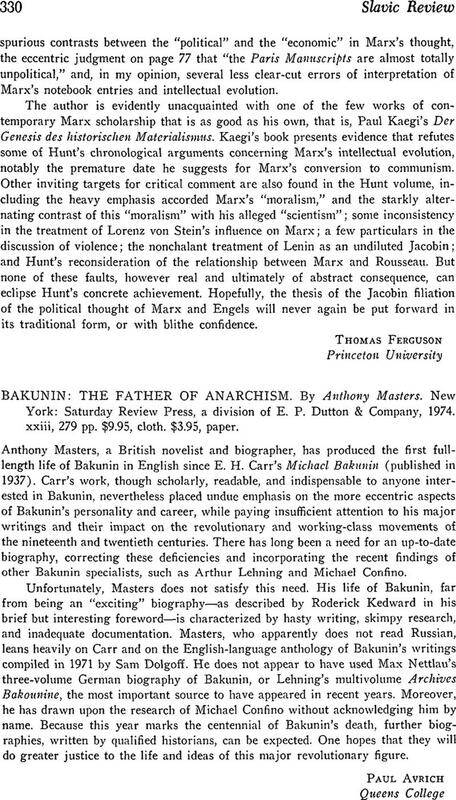 Masters, who apparently does not read Russian, leans heavily on Carr and on the English-language anthology of Bakunin’s writings compiled in 1971 by Sam Dolgoff. He does not appear to have used Max Nettlau’s three-volume German biography of Bakunin, or Lehning’s multivolume Archives Bakounine, the most important source to have appeared in recent years. Moreover, he has drawn upon the research of Michael Confino without acknowledging him by name. Because this year marks the centennial of Bakunin’s death, further biog¬raphies, written by qualified historians, can be expected. One hopes that they will do greater justice to the life and ideas of this major revolutionary figure.